(iii) Computer proficiency - MS Office, Excel, Power point etc. 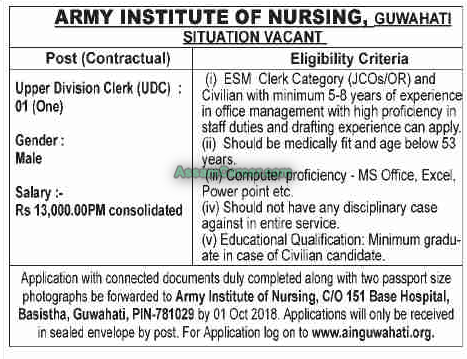 How to apply: Application with connected documents duty completed along with two passport size photographs be forwarded to Army Institute of Nursing, C/O 151 Base Hospital, Basistha, Guwahati, PIN-781029 by 01 Oct 2018. Applications will only be received in sealed envelope by post.